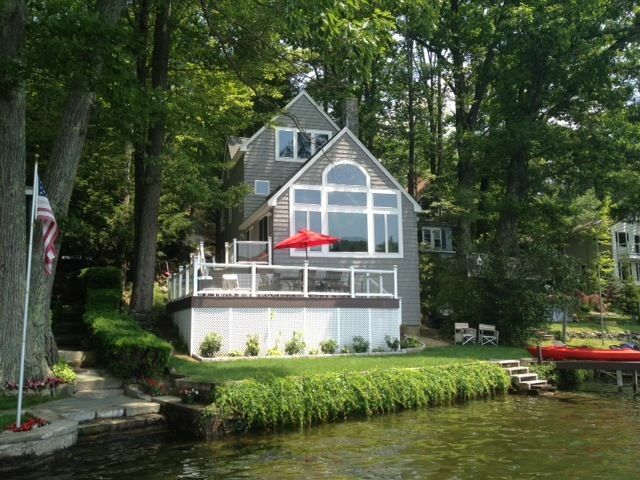 Enjoy our spectacular new Highland Lake three story modern lakefront home all season long with private gas fireplaces in bedrooms and wood fireplace in living room. Total privacy assured via 60 wide steps down from the road, with a sensational sunset view of the Platt Hill State Park Scenic Reserve over the 1/2 mile wide peaceful Third Bay. Connecticut's second largest lake, 3 miles long and 60 ft deep with 15 ft visibility, is known for it's bass and trout fishing, in numbers & size. Awesome snow, water, & jet skiing, sailing, or kayaking in our beautiful Bay or any of five quiet coves. Oversized two story wrap around deck allows for a large 15 person gathering. Plenty of state forests and parks to explore; don't forget antiquing in Winsted, at the turn of the century the Nation's largest clock manufacturing center. A mere 5 minutes from the Winchester Town Green National Historic District and 1890 Civil War Monument/Tower & Park. Weather permitting, there is offseason snowmobiling and ice fishing on the frozen lake. Located 4 Miles to Super Stop & Shop and a turn-of the-century dine-in movie theater. The location on lake is superb: very private, no road noise and gorgeous late summer sunsets! 1st floor bathroom has an extra large shower with a 2' X 3' glass block window and can accommodate 4 people for rinsing after lake time. PLEASE CONSERVE WATER WHENEVER POSSIBLE, especially when our home is fully occupied and the well is tasked. We've never had a problem, but are always mindful. Bathrooms have nice water views. Wet bar. Central A/C. Large deck with plexiglass railing and lights. Beautiful clean and luxurious house with great layout on a lovely clean lake awesome for fishing and swimming. Views from all the big windows in the house are amazing. House had comfy beds, good quality liners and towels. Kitchen was well equipped for cooking and entertaining. Homeowner was friendly and super responsive. Would love to return! Words cannot describe the beauty of this home! So much fun swimming off the dock, great fishing and we loved the tandem kayak. Went with friends for Labor Day and it was an amazing experience. Highly highly highly recommend. Spent a wonderful family Thanksigiving in a great house with great views. Had construction going on next door starting 9am in the morning with a table saw constantly going...took away from the peace and quiet. Our family felt so at home in this beautiful and well appointed vacation home. The furnishings are top notch and the lake views are stunning through the many windows. We thoroughly enjoyed sitting on the deck drinking coffee in the morning, lunch in the afternoon, and relaxing with a good book. Chris and Julie are attentive, kind, and very helpful. Thank you so much! Located in the foothills to the Berkshire Mountains which are the southernmost portion of the Taconic Mt Range. This home is on the peaceful east side of the desirable 1/2 mile wide Third Bay, at the private southern end of Highland Lake with a gorgeous late evening waterfront, sunset view over the Paugnut State Forest. A mere 5 minutes drive to the Town of Winchester and just 2 miles from Rt 8 Pinewoods Rd. exit 46. Only a 9 minute drive to Stop & Shop! Your deposit is refundable 60 days prior to arrival date, should you need to cancel your reservation.